Here's what you do: Get a 3DS. When CAPCOM was looking to the App Store to sell Phoenix Wright: Ace Attorney — Dual Destinies, they had to deal with this same group of idiot smartphone users who seem allergic to visual novels. Here's the biggest question: Is Nintendo actually raising brand awareness, or are they just selling to people who already know Nintendo who own smartphones? 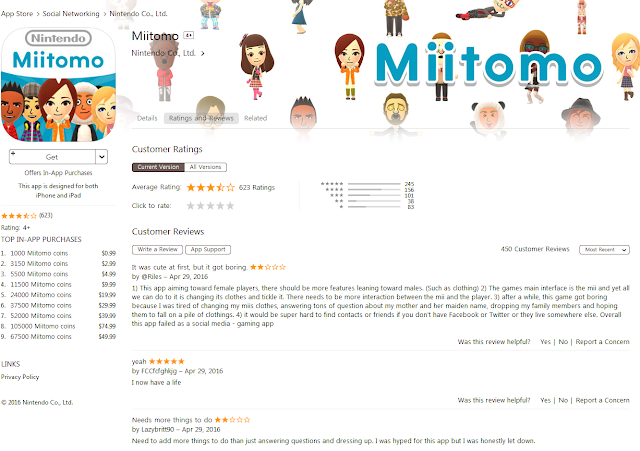 Some of these reviews like how Miitomo isn't censored, unlike Miiverse. Well, sounds like these users already know what a social Nintendo experience is like. The ultimate purpose is to bring these users to Nintendo's dedicated gaming business. Getting them to sign up for Nintendo Accounts was the goal. They did that with 10 million people, and at least some of those are probably new or don't own a 3DS or Wii U. Okay, step 2: Let them know that Nintendo is a gaming company, not a social networking company. That means get games on smartphones. Well, as I briefly mentioned on Wednesday, there will be Animal Crossing and Fire Emblem mobile iterations. According to the same page of the Financial Results Briefing revealing the 10 million Miitomo downloads figure, the Animal Crossing mobile version will offer a “connection” between that and the actual Animal Crossing games, along with offering a “new style of play” exclusive to mobile devices. Somehow, that makes me feel like it'll be closer to Animal Crossing: Happy Home Designer than to a traditional Animal Crossing game. What does it take to be a connection? That's unclear. It could be something like, I don't know, an animal collectathon (using non-traditional gameplay) that uses the same characters from Animal Crossing: New Leaf and might have an encyclopedia on a fact about each animal. After all, the exact wording is, “based on the characters and world of Animal Crossing.” So use similar texture maps/art design, the same characters, and put whatever freemium gameplay you want attached to it. It could be a Tom Nook's Shopping Simulator for all we know. “We are currently developing an application for smart devices based on Fire Emblem. Well, based on Fire Emblem could mean anything. The Castle Siege stage from Super Smash Bros. Brawl was also “represented” based on Fire Emblem. “A more accessible style of gameplay” pretty much means my stripping characters idea for Fire Emblem from seven years ago. This is after Fire Emblem: Awakening and Fire Emblem: Fates already made it “accessible”. How much more accessible can you get? If you're always going to try to dumb down games because it might be someone's first game in the series, you're always going to have dumb games. Ironic, because it's supposed to be a smart device. It's always going to be somebody's first game, even if it's a freaking sequel. ...Anyway, they promise it'll still be a role-playing simulation game, or a strategy game. Right? They don't mean simulation in other ways, right? Right? Source: The Entertainment Software Association's Essential Facts report from 2016. Just released. ...It seems pretty depressing that you go from first place at 38% to 6% for second place. And the way it's worded it doesn't seem like these are mutually exclusive. I don't know the methodology exactly, but either way, this is pretty disparate, especially compared to consoles and PCs. My implication here is that not many people may be interested in a Fire Emblem on a mobile device. It'll need its own separate marketing campaign, all for what is essentially a marketing campaign to get people to Nintendo devices. Is a marketing campaign for a bait marketing campaign to get people to pay attention to your REAL marketing campaigns worth it? The people who currently know Nintendo's plans for new mobile games are already Nintendo fans, aren't they? Nintendo thinks this is all worth it. But I still think people who primarily get their gaming from smartphones would be terrified at videogames actually costing money upfront in the console and handheld sections of the industry. Ludwig is incredibly suspicious of smartphones in general. He still has a flip phone, and he's pleased how he is not constantly emitting data that can be put under surveillance. So far, he doesn't believe he is missing anything by not being able to play these shallow casual mobile experiences. Though, some of the non-gaming apps look like they'd make his life easier... This happens to be KoopaTV's 800th published article. The next-announced mobile game? Super Mario Run, exclusive to iOS. Nintendo is definitely trying a marketing campaign for Fire Emblem mobile: A Battle Ballot! How many of those 10 million Miitomo people will care when the service ends? The service ended, and at least one of those people cared. I am one of those hollow users. Miitomo was an interesting concept, but it just does not have the momentum behind it in order to keep my attention for long. Hopefully the upcoming releases will at least be more fun overall. Also, congrats on 800+ articles. Weelllll, Nintendo wants to pretend there is momentum behind it, as they're rolling out new updates!